Line-fillers were widely used in medieval book art. For a preliminary study of line-fillers, we looked at a small sample of manuscripts dated from 1225 through 1600, from England, France, Italy, and Belgium. Most of the examples with line-fillers were personal devotional books such as Psalters and Books of Hours. The most striking pattern that emerges from our 32 examples of manuscripts with line-fillers is that the zoomorphic line-fillers show up relatively early (the earliest example we examined being 1225 in France, and 1260 in England). The later examples of line-fillers tend to be non-zoomorphic. Rather than evolving into more intricate line-fillers involving zoomorphic and anthropomorphic depictions, they seem to devolve into simpler decorations such as simple shapes and flourishes. One reason for this may be that as book production and demand increased, time to create such elaborate line-fillers may not have been available for scribes. This is but one of many possible reasons; at this point we can only speculate. There may also be biases in our sample that we have not taken into account. In the detail above from fol. 49v of the Luttrell Psalter, there's a boring ol' checkerboard-pattern non-zoomorphic line filler at the end of one line, and a rather subversive, not to mention traumatic, zoomorphic line filler below it. The line is from Psalm 24.21 in the Vulgate: Innocentes et recti adheserunt michi, quia sustinui te, 'The innocent and the upright have clung to me, because I have waited for you'. If the little birds in the nest in the line filler are supposed to represent the innocent, they are not getting very nice treatment from the weaselly animal that is munching them up. Not a great deal of work has been done on line-fillers specifically, especially as aspects of document design in the Middle Ages. 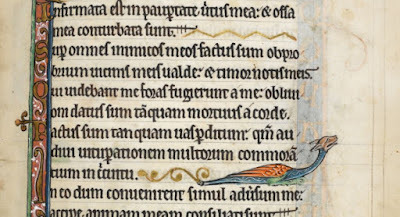 Many questions remain unanswered: for example, do the little animal heads in the line-fillers of the Macclesfield Psalter have any connection with the little animal heads in the line-fillers of the Gorleston Psalter? Or it is just coincidence that a couple of artists liked to draw little animal heads with their tongues sticking out? The concepts of balance, symmetry, and straightforward visual recall, as aspects of the function of line-fillers, give us insight into the mind of the medieval reader of such devotional texts. Perhaps the data from this case study, if examined by a more experienced manuscript scholar or added to an expanded compilation of examples, could enable stronger hypotheses than presented here. Bennett, Adelaide. 'A Thirteenth-Century French Book of Hours for Marie.' Journal of the Walters Art Gallery 54 (1996): 21-50. Clanchy, M. T. From Memory to Written Record: England 1066 - 1307. 3rd ed. Chichester: Wiley-Blackwell, 2012.
de Hamel, Christopher. The British Library Guide to Manuscript Illumination: History and Techniques. London: British Library, 2001. Dennison, Linda. 'The Technical Mastery of the Macclesfield Psalter: A Preliminary Stylistic Appraisal of the Illuminators and Their Suggested Origin.' Transactions of the Cambridge Bibliographical Society 13 (2006): 253-88. Panaytova, Stella. 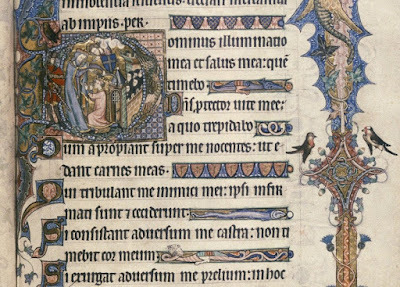 The Macclesfield Psalter. London: Thames & Hudson, 2008. Thompson, Edward Maunde. 'The Gorleston Psalter.' Burlington Magazine 13 (1908): 146-51.